Many years ago, I came across a short item in Sunset Magazine (August 1991) that described using a bucket to feed a drip irrigation system. This had a great deal of appeal to me, as I did not want to mess with the complications of hooking up a drip system to a water supply. My recent Google search for "bucket drip" or "gravity drip" revealed that this system is in widespread use in the developing world. The bane of drip irrigation is clogging of the drippers, and to a lesser extent, the lines, so some sort of filtration is needed. The basic system is very simple: drill a 3/16" hole as close to the bottom on the side of a 5 gallon paint bucket or other container as you can. Insert 1/4" drip tubing (use a small screwdriver, and this will take some force). No additional sealant is required if the fit is tight. Inside the bucket, place an adaptor (which serves as a filter: see below). Hint: it is much easier to attach the filter to the line and then insert the line into the hole in the bucket from inside the bucket, rather than trying to put the filter on the line after it is inserted in the bucket. 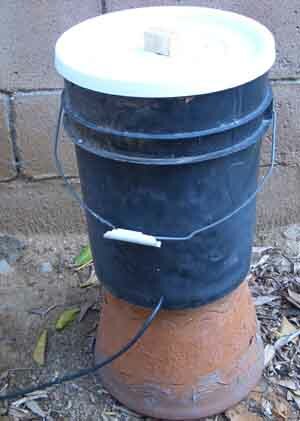 Place the bucket on something to elevate it, and turn the the bucket so that the tube is at the lowest point. I prefer to use the more supple 1/4" vinyl (rather than polyethylene) tubing, as it is easier to work with. The 1/4" size is often referred to as "micro tubing". If your bucket is too transparent (some food supply buckets are) the light will encourage the growth of algae. Whatever you use to elevate the bucket needs to be sturdy, as water is heavy (5 gals is about 33 lbs.). Try to place the bucket on the highest ground. I would use a larger container (such as a small heavy duty garbage can), but I don't have a way of elevating it. 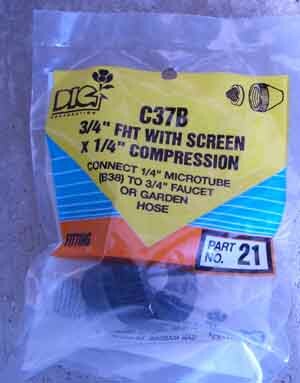 For the filter, I use DIG corporation part number 21 (also known as C37B). It comes with a conical screen filter washer, into which I insert a very small quantity of aquarium filter floss (about 3/4 of a teaspoon; don't pack it tight). You can get part 21 at some Home Depot retail stores (as of August 2007). You can also use polyester batting (available from fabric stores; the stuff seems identical to aquarium floss) instead of filter floss. An alternative part is Raindrip Swivel Connecter A325C (3/4" Hose Thread Swivel x 1/4" Compression Adaptor), which are available at Amazon.com and Lowes retail stores for about $1.50 (as of August 2007). Also, Mister Landscaper makes a part that actually looks easier to use, since inserting tubing into the adaptor is not easy. Other alternatives are to make filters out of found materials. Drill a hole in a bottle cap or a drinking cup, inset tubing, seal the seams with silicone seal or Amazing Goop, and fill loosely with filter floss. A section of window screen cut to fit just inside the bottle cap or cup will keep the floss from coming out. 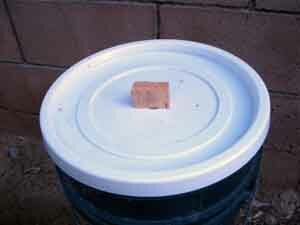 Bucket lid details: Attach a piece of scrap wood (such as a piece of a old broom handle, or any small block, as shown, using a wood screw) to serve as a handle for the lid. Be sure to drill a small air hole in the lid to allow air into the bucket - otherwise the water will not run out the tube. Without a lid, debris will fall into your bucket and create clogs. Also, since you will have a small amount of standing water in the bucket, you want to keep mosquitoes out. Inline drippers have two barbed prongs (left). Terminal drippers (right) have one. Inline drippers. I prefer to use Raindrip mini inline drippers so that I can string them all in a line. If you use terminal end drippers, you end up with too many divergent lines. The disadvantage to a long line of inline drippers is that a clog in the tubing denies water to all of the drippers downstream. I end the line with a terminal dripper. I like to keep the drippers elevated off of the soil (with stakes) so that I can see the drops as a visual check. You will need to purchase a supply of barbed connectors to join parts of the line together, as your lines become a patchwork of different lengths spliced together. I use pliers coated with electrical tape to put (and remove) the brass adaptor on the faucet: the sharp threads are not friendly to bare hands. Dripper testing and unclogging. I throw all suspect drippers into a jar and soak them in a vinegar solution, with some jar shaking. To test them, I hook up one of the filter adaptors (see above) to a faucet, using Python part number 69HD brass faucet adaptor. You can get this part from pet/aquarium stores or online, and I suspect that a similar adaptor is available from hardware stores. Python does make a plastic version of this adaptor, but I found it very difficult to use. You may have to rig up a different adapter setup if your faucet has different threads. I add a short length of tubing; I then connect up a dripper and turn on the faucet (just a little pressure is needed). With inline drippers, you have to cover the end with your finger to force the water out of the dripper hole. If it doesn't drip, I try to clean out the hole with a dissecting needle. If that doesn't clean it out, I put it aside in anticipation of the day that I discover a better method of unclogging. Light duty pruning shears: Tubing is harder to cut than it looks; you can use scissors or wire cutters, but good pruning shears do it effortlessly and make for a cleaner cut. Pliers: use two pairs of inexpensive pliers to pull tubing apart from drippers or connectors; it can take quite a bit of force to get them apart, especially in cold weather. Locking Forceps: (also called hemostats) inexpensive non surgical versions are used by fishermen to help unhook fish. I use these to close off the flow of water when working on replacing drippers and tubing sections. Jann's Netcraft has inexpensive versions. Vise Grip Pliers might also be used instead of hemostats. I imagine a C-Clamp (which could be a lot cheaper) would also work. Dissecting Needle: instead of a safety pin for unclogging and piercing, I prefer to use a dissecting needle, basically a pin with a handle. You can often get these at college campus bookstores or on the web. For safe storage, stick the needle into a cork. The Design Process for the IDE Low Cost Drip Irrigation System ... (Archive.org copy, loads slowly) Shows a real economical approach to the system. Inexpensive clogging relief. I prefer drippers and tubing made by Raindrip. 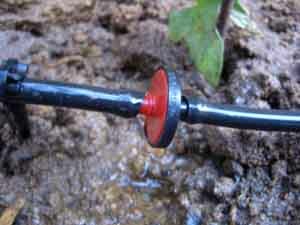 You can still get the 1/2 gph mini inline drippers from Lowes retail stores (as of August 2007). A google search for mini inline drippers will get you other dealers.